JOINER Firm Architect Joins the AIA Joby Copley, Partner, has joined the American Institute of Architects (AIA) Along with existing AIA-members in the firm, Joby affirms the commitment of JOINER Architects to the architectural design community. ESD 100 Hires JOINER Architects for New Training Center The Harris County/Fort Bend County Emergency Services District 100 has hired JOINER to complete a new 17,000 SF Training Center for the Community Volunteer Fire Department (VFD). The Center will be located adjacent to the Department’s existing Fire Station No. 1. Partner Scott Brady Completes Term as Rotary Club President Scott Brady, JOINER Architects Firm Partner, has completed his tenure as the President of the Rotary Club of East Montgomery County. During Scott’s leadership, the Club grew in size and reach, while completing several important service projects in the community. TASA/TASB Convention Awards JOINER’s Student Center The recently completed Student Center for Lone Star College – North Harris has been awarded by the 2012 TASA/TASB Exhibit of Architecture for “Innovative Design”. 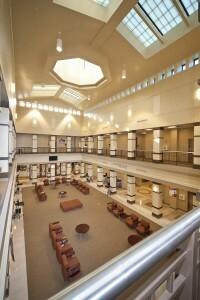 The building features a 2-story, naturally day-lit atrium surrounded by student and administrative functions, and serves as the new hub of campus activity. JOINER Opens Bay-Area Satellite Office JOINER Architects opened a second Houston-Area office location, in addition to the main office in Kingwood. The new location, in League City, will help us better serve our clients and respond more efficiently to their needs. The JOINER home office has maintained the same location for nearly 30 years.